Do Stickers work for tires? Do Stickers Work For Tire Lettering? People ask if stickers will stick to a tire. With the right type of adhesive backing the answer is yes. Will they last? NO. 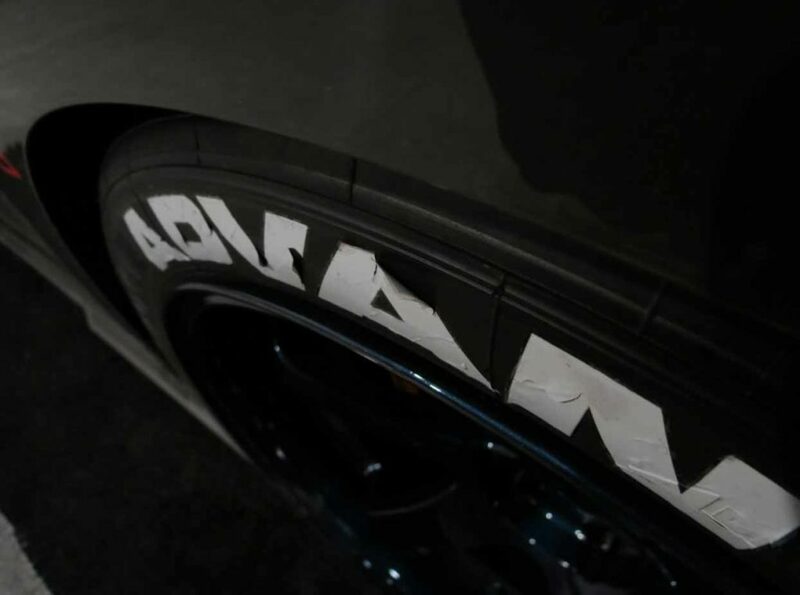 – While stickers can be slapped on a tire, the antiozinants and other chemicals quickly break the adhesive down and the bond will fail. What about just sitting at a show? Great question. The fact is anything placed on the sidewall will be affected by the chemicals in the tire. 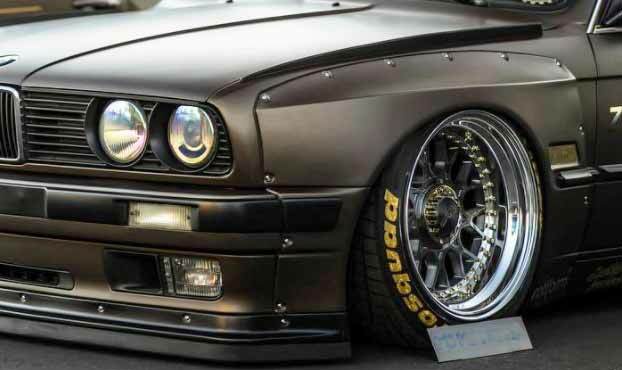 We have seen stickers applied to a tire at the SEMA show and by the end, the stickers turned black and brown. No one wants their car to look cheap, especially at a show. Further, when leaving the show you don’t want people to see stickers flying off your tire. Can you Clean a sticker? You might be thinking, I can just clean the stickers. Not really. Because the bond is being compromised, any scrubbing will speed the removal of the sticker. Also, those brown stains (unlike the sticker) are permanent, because they come from behind and have migrated all the way through the sticker material. Something Better Than Stickers for a Tire? They say necessity is the mother of invention, and that’s exactly what inspired us to create the TredWear rubber tire lettering kit as an alternative to stickers. At TredWear.com we appreciate all types of vehicles. Even big trucks. That’s where we developed our product. The original permanent rubber tire graphic. 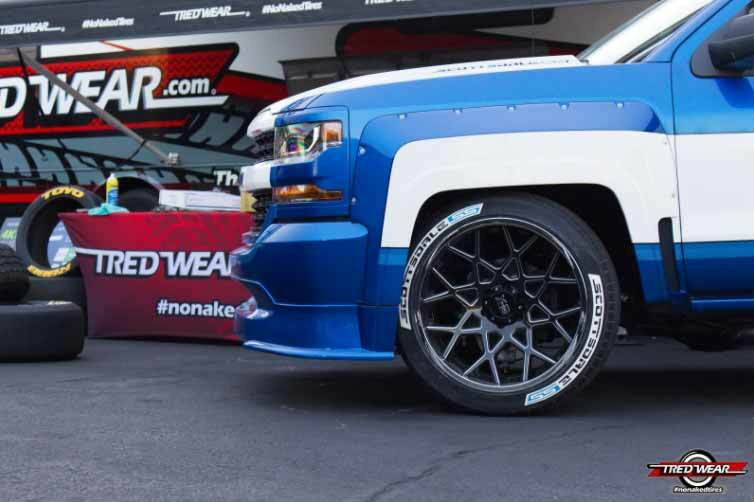 We were sick of all of the problems, and poor results that tire paint pens, stencils and stickers produced, so we created the ultimate solution for custom white letter tires. The solution is, raised white tire letter inserts made out of a patented durable rubber composite compound coupled with a patented adhesive that bonds the letters to your tire. The adhesive bonds the letters like they were a permanent part of the sidewall. Why? Because this adhesive cures unlike the adhesive on a sticker. The result is indistinguishable from a factory made raised white letter tire. If the letters are installed correctly the results will last for the life of the tire – A sticker on a tire could never make such a claim. No Stickers Needed to Make White Letter Tires! Our Customers Speak Pretty Loudly too. Our customers are very enthusiastic about how great our raised white rubber tire letter inserts are. They explain how much better the result is than a sticker, and they can’t believe something like this was not available before now. Keep in mind some companies have tried to copy us but TredWear.com is the original permanent tire graphics solution. So put the stickers where they belong……. In your mom’s scrapbook.